Each container contains 4 pieces, a complete set for front and rear. Note that packaging has not been completed yet, so these brake pads will be offered at "early bird" pricing and will be shipped in simple plastic bags. Thanks to our 2015 purchase of a brake testing machine, our R&D department has been busy examining ways to improve the rider's experience for all carbon rimmed wheels. They were pleased to discover that the European brake pad manufacturer Swissstop's brake pads for carbon rims are an excellent match for the high temperature resins and high friction braking surfaces on Pro-Lite wheels. Benefits included superior braking as well as lower mean temperatures at the rim. As of spring/summer 2016, we have started including Swissstop brake pads with all carbon-rimmed wheels except the Padova and Rome, which due to their unique rim composition will still be offered with blue brake pads. Swissstop pads may be used on the Rome and Padova, but real-world testing found that the performance improvement was less pronounced and might not warrant the added cost of imported European brake pads for many riders. New for 2016! Suitable for all Pro-Lite wheels with carbon braking surfaces. From 2016 on, these are the new standard of excellence for Pro-Lite carbon wheels. Direct from Swissstop's European factories, real world testing has shown these pads to offer improved braking performance, while back to back testing finds cooler rim temps under the same conditions. 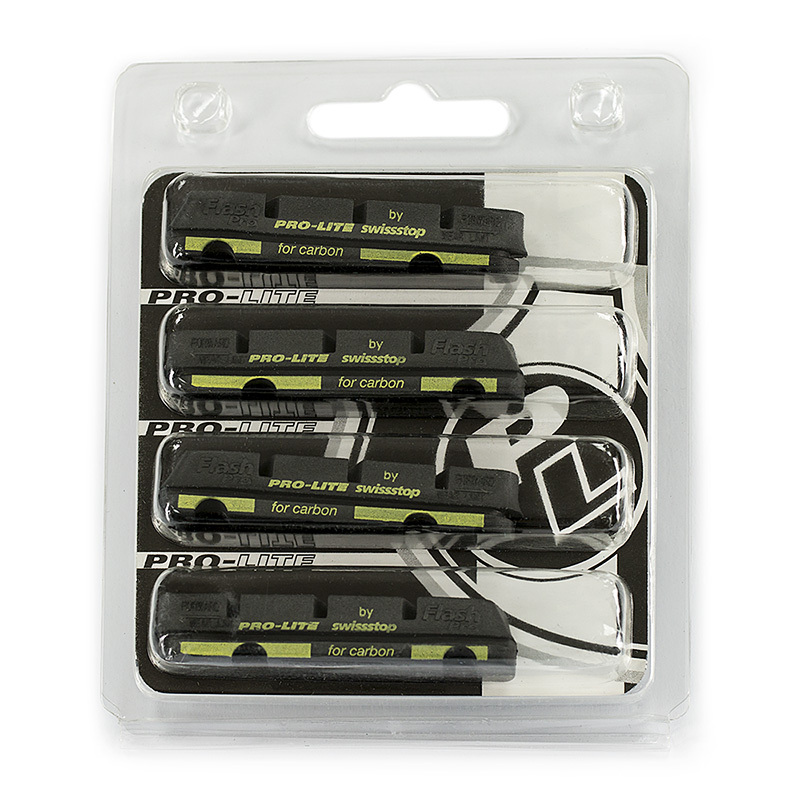 If you want to enhance the longevity of your carbon wheels and at the same time get better braking performance, try the new Pro-Lite brake pads for carbon rims. These will be included with all new carbon rimmed wheels shipped out starting in the summer of 2016 except the Padova and Rome, which will continue to use the blue brake pads. The Swissstop pads may be used on the Padova and Rome as well. If you need pads for alloy rims, please jump over here.